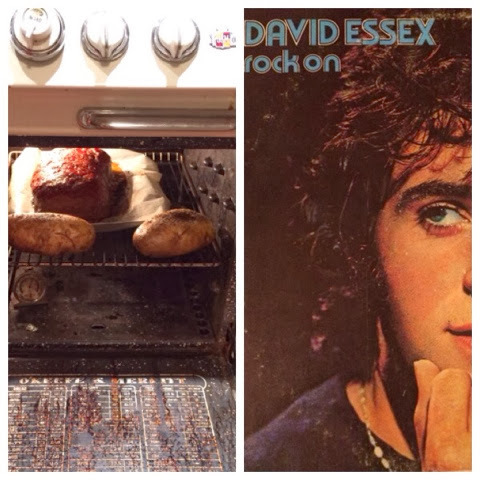 Inspired by this article in the recent BA, I've had baked potatoes on the brain. Was going to roast a chicken so I could use the carcass to make stock, but a) I don't have room for more stock in my freezer, wtf is my problem and b) meatloaf sounded SO good. My go-to meatloaf uses beef and pork and sometimes veal, but I went wild and am using a new 'recipe'. More fast n loose than my usual. We'll see, it's baking now. I also want to make these cookies, but House of Cards is calling. Two giant russets, scrubbed. Pricked, rubbed with olive oil, generously sprinkled with fresh ground tellicherry black pepper and sea salt. Baked directly on middle rack at 400 for about an hour. Halve a red onion. Pulse it to bits in a food processor. Toast 3 slices GF white bread. Pulse bread in the food processor until it's crumbly. Add 1 cup milk. Let it soak while you do an initial mix of bowl ingredients. Add milky bread to bowl. Knead until just mixed. Form into a loaf-like mass on a parchment-papered rimmed baking pan. 400 degrees for about an hour and 15 minutes, depending on your oven. Upside: way faster and easier.